Merriam-Webster defines ergonomics as: An applied science concerned with designing and arranging things people use so that the people and things interact most efficiently and safely. Experts in ergonomics strive to design and produce items that better match the capabilities, limitations and needs of the people who use them. The result is a safer product that causes less fatigue and stress on the body, while still allowing you to perform the same functions as with regular tools or items. Repetitive gardening activities can put you at risk for carpal tunnel syndrome and tendonitis, and can exacerbate other conditions such as arthritis, sciatica and other aches and pains. Poor movement or sudden strains can pull muscles or pinch nerves, which can lead to days or weeks of recovery, doctor appointments, tests, medications and other treatments. Even worse movements could lead to more severe injuries, falls or sprains which could cause you to miss out on a gardening season altogether. Listen to your body – if a movement hurts, change what you are doing and the tools you are using. 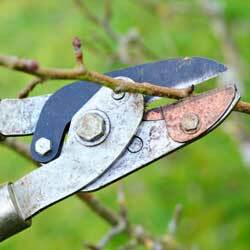 Before purchasing the tools required to perform your garden chores it is best to choose those that fit the job – weeding, pruning, digging, trimming, harvesting, raking, etc. It is equally important, however, that the tools fit you as well – your size, your grip, your posture and your preferences. Ergonomic tools will help you accomplish different garden tasks with greater efficiency and reduced effort, force, bending, leaning or twisting. 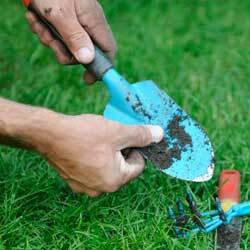 With the correct tools you will be able to dig, trim and cut more, in less time, with less effort and more gardening enjoyment. Some ergonomic tools may look no different than the familiar tools you’ve been using for years, but they may be made of different materials to be lighter or stronger. There may be angle or length changes in handles to allow for easier use, or handles may be cushioned to provide firmer grips without causing pain or fatigue. Some tools, such as portable stools or combined tools that include buckets as well as a seat or kneeling pad, help make gardening chores more accessible and comfortable as well. Ask one of our employees for their assistance in making your garden equipment choices. We carry a wide selection of ergonomic garden tools and are happy to help you choose the right device, size and style for you to accomplish your gardening chores safely and pain free.